A uniquely practical approach to intellectual property law: unfold the problem, reveal the law, apply to life. 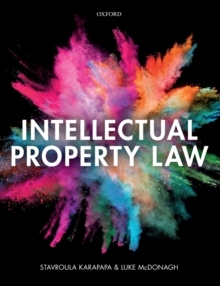 Using this new and innovative textbook, students are given a problem scenario to unfold; as they do this they will learn to understand the key questions and issues surrounding each area of intellectual property law. As each problem is explored, clear explanations reveal the central legal concepts underpinning the relevant topic. Further illustrations and references to the problem apply the law, enabling students to see for themselves how the law interacts with everyday life and business and giving them a deep and practical understanding. Online Resources A range of additional online resources are provided online, including guidance on how to approach the questions contained in the book, regular updates on legal developments, links to useful websites, and examples of relevant documents.